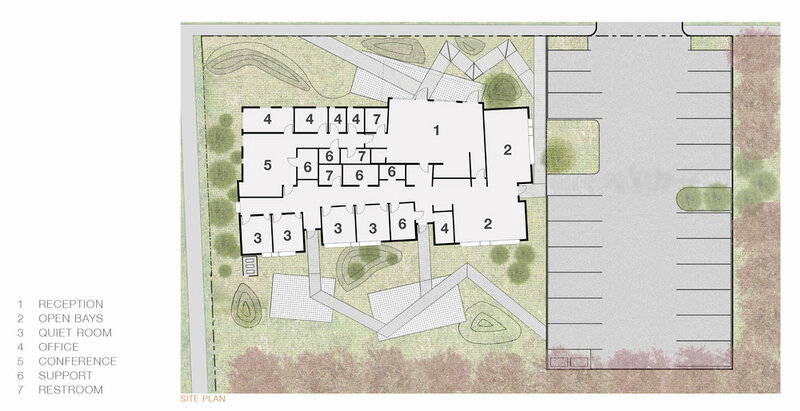 Designed to meet the specific goals and needs of the Dental Clinic staff, the project responds to distinct site conditions to create a bold proposal in a suburban context. Located on a corner site adjacent to a large shopping area in Lake Stevens, Washington, the proposed site and building design embraces the linear arrangement of existing cherry trees at the rear and side of the site. Along the other project edges, the design engages the streetscape to provide an urban solution in contrast to its surrounding context. A network of plazas and paths encourage pedestrian activity around the building at all sides while providing a buffer to the street corner and adjacent shopping area. The structure is designed to be a single story in order to locate all program at the ground level, with openings strategically located to capture views of the existing cherry trees and the proposed plazas and landscape spaces. The project is comprised of three distinct program areas: entry/circulation, patient rooms and open areas and support/service areas. The design articulates these areas at both the interior and exterior, with the roof design expressing the entry and circulation spaces as distinct from the remainder of the program spaces with vaulted interior ceilings and clerestories. A canopy at the exterior extends the higher roof area and further highlights the building entry and front plaza.